ROCK OR DIE Monthly #35 is aired at 7:30 pm (GMT+9) on Friday, May 3rd 2013. Following 4 bands come up for the show. After it was aired in Japan, it can be heard on podcast on our site. 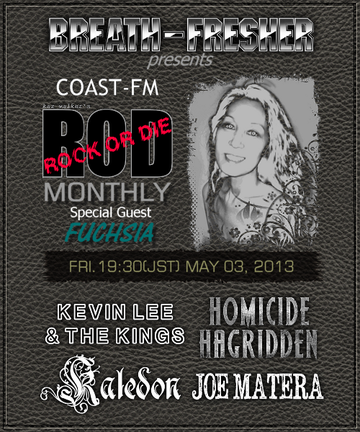 HOMICIDE HAGRIDDEN - Album "US"
JOE MATERA - Album "Creature Of Habit"
KALEDON - Album "Altor: The King's Blacksmith"
KEVIN LEE & THE KINGS - Album "Break Out"